It was the strangest of scenes. We were in a high security prison celebrating with song the generations-old holiday of our freedom. 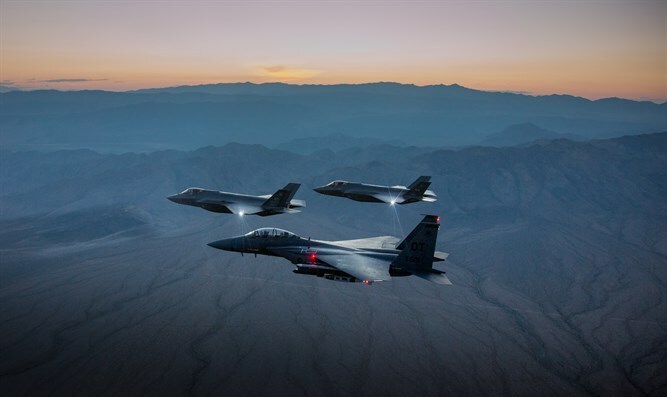 F-35A Lightning II Joint Strike Fighter leads formation of other fighter jets. On Thursday, April 2, 1970, the Israeli Air Force attacked Syrian tanks and artillery in the Golan Heights. Three Syrian MIG jets were downed, as well as one Israeli Phantom jet. Israeli pilot Gidon Magen and navigator Pinny Nachmani parachuted out of the jet safely, but were captured by the Syrian enemy. They sat the next three years in the high-security Mezze military prison in Damascus where they spent four Seder nights, the festive first night of Passover. The Pesach (Passover) holiday has passed, the quintessential national holiday of the Jews. We are amongst the few who are prevented from celebrating with our families. It's difficult to describe the Passover atmosphere in Syrian prison. On the morning before, we meticulously cleaned our cell (removing any crumbs of leavened bread) in a way that the cement floor had never been cleaned before. On cardboard, we drew a Seder plate, with a Star of David in the middle and room to place each ingredient on the six protrusions of the star. In the afternoon, we succeed in organizing permission to shower, albeit in freezing water, after which we donned our holiday clothes and anxiously waited for the beginning of the holiday (at nightfall). These were difficult hours of contemplation - the memories which swelled up to the point that we choked as we recalled our homes, and tried to feel the atmosphere of Pesach as sundown approached, and sense the distinct smells of the late afternoon. We yearned to feel on our flesh the festive excitement, the cold winds blowing down from the hills to the valley, wrapping the city of Yokneam in the holiness of the holiday, knowing that the entire House of Israel is dressed in white, that your children and families are waiting in anticipation, and yet, you are helplessly stuck here, turning from side to side on a stinking mattress. Time inches along, to the rhythm set by the two Pesach Haggadahs (Seder night service booklets) and the crumbs of matzah which were delivered to us by the Chief Rabbi of Zurich. These instilled within us the true feeling of Seder night. The Seder night flowed. When Boaz Eitan (another pilot who was captured a month after them), the youngest amongst us, almost a child, began to sing the Four Questions, I felt tears in my throat. But those fleeting moments of emotion passed as immediately we broke out in joyous song. It was the strangest of scenes. Here we were in an enemy country, inside of a high security prison, three Israeli prisoners of a war of freedom, celebrating with song the generations-old holiday of our freedom. As we celebrated and loudly chanted the Hagaddah, the prison guards appeared and demanded that we stop. In the next cell over sat the recently-deposed President of Syria Nureddin al-Atassi, the very man who when he had imprisoned us declared, "Let the Israeli prisoners age in Syrian prison." Now, he was in the same boat with us. Apparently, our singing disturbed him, and he asked the prison guards to shut us up. Even the horrid threat of solitary confinement could not stop the roar of freedom. We concluded the Haggadah with the singing of "Had Gadya." But, we continued the celebration by singing Israeli songs like "Yerushalayim shel Zahav," and "Shneinu m'oto ha'Kfar" and others that, though not related to the Pesach holiday, empowered us to continue the celebration into the night, and take our small revenge. It was the longest Seder night I have ever attended. We had to be captured by the Syrians in order to carry out what is written in the Haggadah, "And they would tell the story of the exodus from Egypt all night." Postscript: In June 1972, the elite Matkal Unit of the Israeli army kidnapped five high-ranking Syrian officers as bargaining chips to free the three prisoned pilots. The prisoner exchange was negotiated and carried out a year later on June 3, 1973.